Tambora Sub-district Head, Djaharudin, leads dozens of joint personnel such as PPSU, PHL, Forestry Sub-dept., Environment Sub-dept. and Satpol PP who are conducting arrangement along Jalan Pekojan III, West Jakarta, Monday (2/5).
" 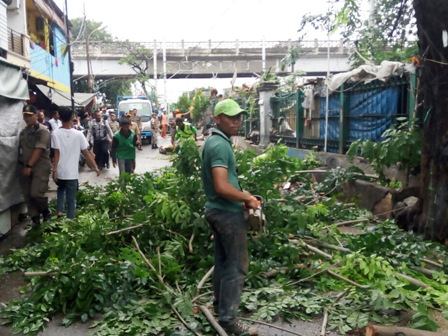 We've socialized this activity to local citizens about arrangement of Jalan Pekojan III"
In the field, those personnel look tear down illegal buildings standing on the roadside, control illegal parking and prune trees that prone to fall. "We've socialized this activity to local citizens about arrangement of Jalan Pekojan III," he expressed. Actually it had been done some time ago. But illegal buildings and illegal parking are seen exist again along the road. "So, today's activities simply make a notice to the citizens," he told. Previously West Jakarta Mayor, Anas Effendi had instructed his ranks to arrange Jalan Pekojan III that looks chaotic.